One of the [many] things we are passionate about is relationships. Relationships with each other, relationships with Christ, relationships in the church, relationships outside of the church, relationship with self, and with possessions…all are important. Through the book When Helping Hurts we have come to believe that the foundational cause of poverty is relational, so the solution must be relational as well. In Nicaragua, we aren’t going to offer anything other than ourselves. We want to encourage and foster healthy relationships and the first step to doing that is showing the kids that they worthy of love, that they are beloved. This is no small task. Life is messy. People are messy and relationships are terribly messy. And, I think, terribly beautiful. The above picture was taken in August, 2010 in Nicaragua. 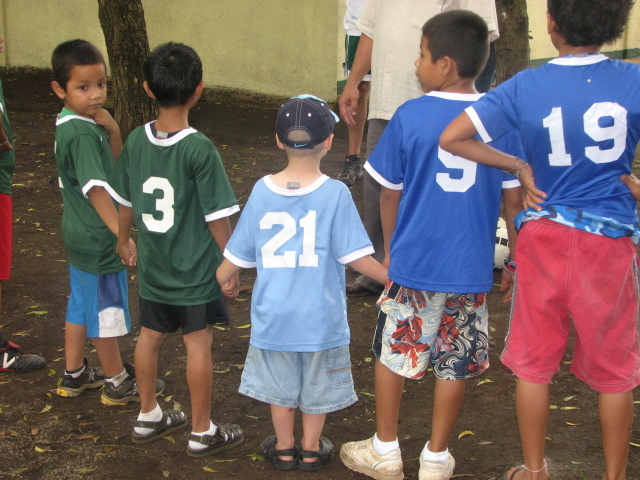 Tate attended a soccer camp with the kids in the orphanage and although he was nervous to go, the little boys took great care of him.